I remember back in the 80s and 90s there was a real craze for Japanese restaurants. They were sooooo expensive. It was a special occasion to dine out for Japanese, something fancy and Far-eastern exotic that you didn’t do every day. But home-style, authentic Japanese food can be cheap. Surprisingly cheap. 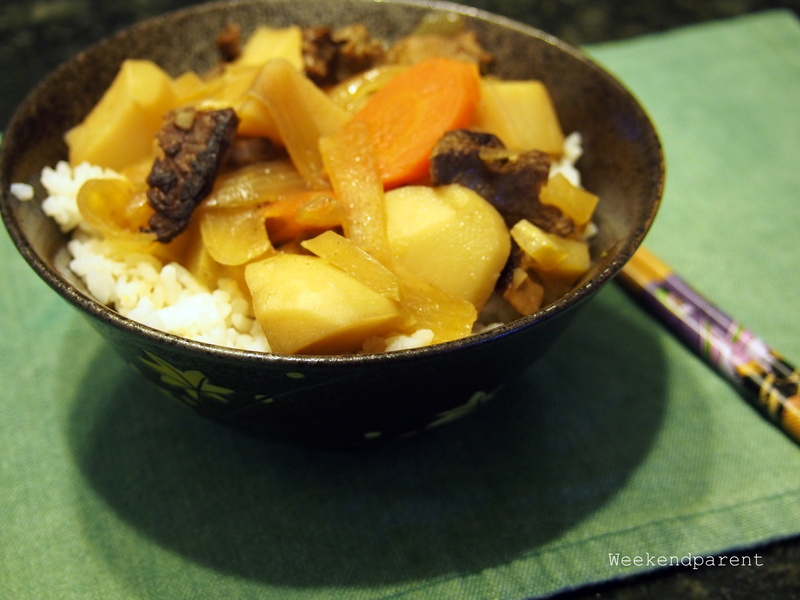 Nikujaga means meat and potatoes in Japanese, and that is pretty much what is in this dish. But oh, meat and potatoes elevated to a new level, not at all stodgy and extremely homey on a cold winter’s night. It is one of those dishes that once you have tried, will become a firm favourite. It is very frugal, and also flirty. Japanese housewives reputedly take their homely duties seriously. Economically, Japan is now facing problems about the underutilized participation by women in the workforce. But still, there is a stereotypical view that Japanese women are good in the kitchen, and at keeping house. So, if a Japanese man is romantically interested in a woman, he may ask her how she makes Nikujaga. It is kind of a litmus test about the type of wife she might make. How would I answer if I was asked if asked this question by a handsome man? Well I think I have just made Nikujaga even more frugal than the most economical Japanese housewife. I used a leftover beef chop from a BBQ in this recipe. I took it home in a reused plastic container, sliced it thinly and then placed it in the freezer until it was ready to use. Traditionally this dish is made with snowpeas, but I deemed them too expensive so used broccoli stalks instead. (Never throw out broccoli stalks, they are far and away the best bit.) I also decreased the amount of alcohol (so it is more suitable for sharing with children), and substituted cheaper Chinese Shaoxing wine (a Japanese housewife might be horrified, but I couldn’t tell the difference). 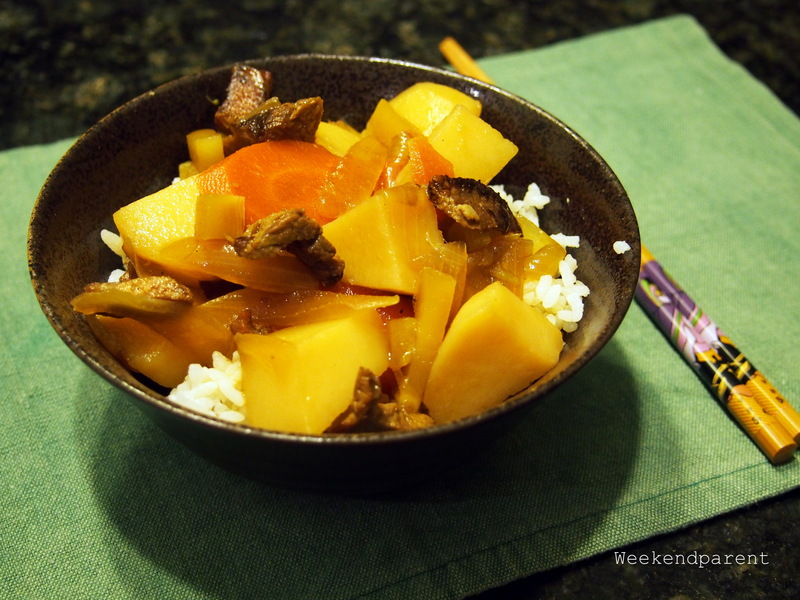 You can use sherry instead of rice wine. I once made it with some leftover white wine I needed to use up, and it was fine. Fry the beef in the oil until just brown. Remove and set aside. 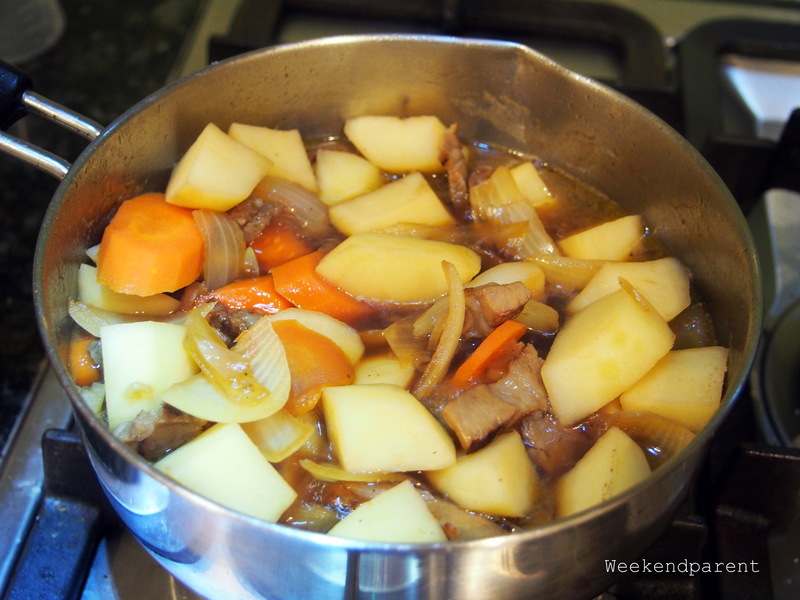 Add the potato, onion and carrot back to the saucepan, cover with water and dashi (if using) and bring to the boil. Cover with a tightly fitting lid, or ideally cover with aluminium foil just over the surface of the mixture. Cook on a low heat for around 15 minutes. Add the sugar, soy sauce and wine, and cook for a further five minutes. Prepare the broccoli by peeling off the tough outer layer of the stalk and slicing finely. Add to the mixture for the last few minutes of cooking. Turn the saucepan off the heat and allow it to sit for around 30 minutes so that the flavours infuse. Serve hot over short-grain rice.